میرشفیعی, سمیرا, انصاری, حسین, میان آبادی, حجت. (1394). روش‌های نظریه ورشکستگی در تخصیص منابع آبی مشترک (مطالعه موردی: رودخانه اترک). نشریه آبیاری و زهکشی ایران, 9(4), 594-604. سمیرا میرشفیعی; حسین انصاری; حجت میان آبادی. "روش‌های نظریه ورشکستگی در تخصیص منابع آبی مشترک (مطالعه موردی: رودخانه اترک)". نشریه آبیاری و زهکشی ایران, 9, 4, 1394, 594-604. میرشفیعی, سمیرا, انصاری, حسین, میان آبادی, حجت. (1394). 'روش‌های نظریه ورشکستگی در تخصیص منابع آبی مشترک (مطالعه موردی: رودخانه اترک)', نشریه آبیاری و زهکشی ایران, 9(4), pp. 594-604. میرشفیعی, سمیرا, انصاری, حسین, میان آبادی, حجت. روش‌های نظریه ورشکستگی در تخصیص منابع آبی مشترک (مطالعه موردی: رودخانه اترک). نشریه آبیاری و زهکشی ایران, 1394; 9(4): 594-604. عدم مدیریت و حکمرانی صحیح و افزایش تقاضا برای بهره ­برداری بیش­تر از منابع آب، سبب افزایش تنش بر سر منابع آبی مشترک است. در اکثر موارد، میزان آب در دسترس ازمیزان کل نیاز ذی ‌مدخلان کم­تر است و همین امر باعث ایجاد اختلاف میان آن‏ها می‏گردد. ارائه روشی مناسب جهت تخصیص عادلانه‏ منابع آبی مشترک اقدامی مؤثر در زمینه مدیریت تضاد در چنین شرایطی است. تئوری ورشکستگی زیر مجموعه‌ای از نظریه بازی‌ها است که با روش­های متعدد به بررسی مسئله بازتوزیع منابع مشترک محدود بین مدعیان می‌پردازد. 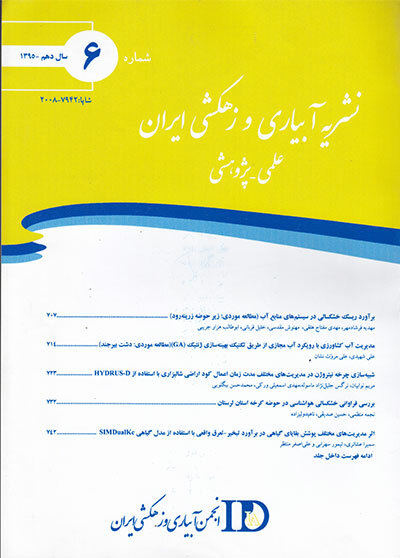 در این مطالعه 6 روش از تئوری ورشکستگی: ورشکستگی نسبی4 (PRO)، ورشکستگی تعدیل شده5 (AP)، تالمود6 (TaL)، پینایل7 (Pin)، ورود تصادفی8 (RA) و قوانین اشتراک متناوب (SSRbased on PRO)تشریح و کاربرد آن‌ها در بازتوزیع منابع آب مشترک بررسی شده است. محدوده مطالعاتی این تحقیق، حوضه آبریز اترک واقع در استان گلستان و متشکل از 5 منطقه است و بخشی از رودخانه با استفاده از تئوری ورشکستگی بین این مناطق تقسیم شده است.از آنجایی که هر کدام از روش‏های این تئوری، رویکردی متفاوت نسبت به مسئله عدالت دارند و هم­چنین از قوانین ساده و قابل درکیبرای تخصیص استفاده می­کنند، می‏توانند به عنوان شروعی برای مذاکره و تصمیم‌گیری نهایی بین ذی ‌مدخلان به کار گرفته شوند. در این مطالعه با استفاده از قانون تعدد،روش‏هایPRO،AP،RA، Pin به­عنوان روش‏های مناسب­تر انتخاب شدند. Conflict over shared water resources has been occured in result of mismanagement,bad governance and increasing water demand. Therefore, equitable water allocation is one of the important tools reducing conflict. In this paper, we investigate application of six methods of bankruptcy theory:Proportional (PRO), Adjusted proportional (AP), Talmud (TaL), Pinile (Pin), Random arrival (RA), Sequential sharing rules (SSR based on PRO). The area study includesfive regions along Atrak riverin Golestan province. Total available water depending on water requirementsof each region is divided with bankruptcy theory. Since each method has different definition of fairness, so different results can be obtained. According to Plurality Rule, it shows that the results of PRO, AP, RA, Pin theories are the superior ones in this case study. Results of this study can be a starting point for negotiations and making agents’ final decision. زارع زاده،م. 1389. تخصیص منابع آب حوضه آبریز قزل اوزن-سفیدرود تحت تاثیر تغییر اقلیم با به کارگیری رویکرد ورشکستگی در حل اختلافات. پایان نامه ارشد، دانشگاه تربیت مدرس، تهران، ایران. شرکت مهندسی مشاور طوس آب، اردیبهشت 1388، گزارش نهایی، جلد سوم طرح توسعه بهره برداری و مهندسی رودخانه و تعیین حد حریم و بستر و حفظ حریم رودخانه اترک، مطالعات مرحله اول، وزارت نیرو،آب منطقه‌ای استان گلستان. Ahuja,R.K., Magnani,T.L and Orlin,J.B.1993. Network flows, New Jersey, Prentice Hall. Ansink,E. 2009. Game-theoretic models of water allocation in transboundary river basins, Wageningen University. Ansink,E and Marchiori,C. 2010. Reallocating Water : An Application of Sequential Sharing Rules to Cyprus. Working paper. Ansink,E., Weikard,H.P. 2012. Sequential sharing rules for river sharing problems. Social Choice and Welfare. 38.2: 187–210. Ambec,S and Sprumont,Y. 2002. Sharing a River, Journal of Economic Theory, Elsevier. 107.2: 453-462. Aumann,R.J., Maschler,M. 1985. Game theoretic analysis of a bankruptcy problem from the Talmud. Journal of Economic Theory. 36: 195–213. Bosmans,K and Lauwers. L. 2011. Lorenz comparisons of nine rules for the adjudication of conflicting claims. International Journal of Game Theory. 40: 791-807. De Stefano,L., Duncan,J., Dinar,S.K., Stahl,K. Strzepek,A. Wolf,T. 2012. Climate Change and the Institutional Resilience of International River Basins. Journal of Peace Research. 49.1: 193–209. Espey,M and Towfique,B. 2004. International bilateral water treaty formation. Water Resources Research, 40, W05S05, doi:10.1029/2003WR002534. Gallastegui,M.C., Inarra,E and Prellezo,R. 2003. Bankruptcy of Fishing Resources: The Northern European Anglerfish Fishery. Marine Resource Economics. 17.4: 291–307. Herrero,C. Villar,A. 2001.The three musketeers: four classical solutions to bankruptcy problems. Mathematical Social Sciences. 42.3: 307-328. Kaminski,M.M. 2000. Hydraulic rationing. Mathematical Social Sci-ences 40:131-155. Madani,K., Zarezadeh,M. 2012. Bankruptcy methods for resolving waterresources conflicts. In: Loucks, D.P. (Ed. ), World Environmental and Water ResourcesCongress 2012. American Society of Civil Engineers, Reston, VA. 2247-2252. Mianabadi,H., Mostert,E., Zarghami,M., van de Giessen,N,. 2014. A new bankruptcy method for conflict resolution in water resources allocation. Journal of Environmental Management 144: 152-159. Mostert, E. 2003. Conflict and co-operation in international freshwater management: a global review, International Journal of River Basin Management. 1. 3: 267-278. O’Neill,B. 1982. A problem of rights arbitration from the Talmud. Mathematical Social Sciences. 2: 345 371. Sheikhmohammady, M. and K. Madani.2008. Sharing a multi-national resourcethrough bankruptcy procedure. Proceeding of the 2008 World Environmental and Water Resources Congress, Honolulu, Hawaii, Edited by Babcock R. W. and Walton R., 1-9, American Society of Civil Engineers. Zarezadeh,M., Madani,K., Morid,S. 2012. Resolving transboundary water conflicts: lessons learned from the Qezelozan-Sefidrood river bankruptcy problem. In: World Environmental and Water Resources Congress 2012. American Society of Civil Engineers, Reston, VA, pp. 2406e2412. Zarezadeh,M., Madani,K., Morid,S. 2013. Resolving conflicts over trans-boundary rivers using bankruptcy methods. In: Hydrology and Earth System Sciences. Discuss. 10: 13855–13887. Wolf,A.T., Natharius,J.A., Danielson,J.J., Ward,B.S., Pender,J.K. 1999. Inteernational river basin of the world. Water Resourse Development, 15: 387-427. Updated on-line October 2002, http://www.transboundary waters.ors.edu/publications/register/tables/ IRB_table_4.html. Wolf, A. 1998. Conflict and cooperation along international waterways. Water Policy 1.2: 251–265.